Gaydell came from the East Coast and as a child told people she would eventually make her home in Wyoming. She attended the University of Wyoming, and met her then-future husband, Roy Hugh Collier. While living in Laramie and the Harmony area, Collier worked as circulation manager at the UW library, and collaborated with Eleanor Prince in producing three publications: Basic Horsemanship: English and Western; Basic Training for Horses: English and Western; and Basic Horse Care. She and her husband purchased their Crook County Ranch in 1977. Collier took over the Crook County Library Director position and was there for 14 years, while also operating her ranch bookstore, Backpocket Books. She was co-editor along with Nancy Curtis and Linda Hasselstrom on three anthologies: Leaning Into the Wind: Women Write from the Heart of the West in 1997; Woven on the Wind: Women Write about Friendship in the Sagebrush West, in 2001; and Crazy Woman Creek: Women Rewrite the American West in 2004. Her publications continued in periodicals, reviews, anthologies, and magazines. Her last book was the memoir, Just Beyond Harmony, published in 2012. She received a Governor’s Arts Award in 2004. 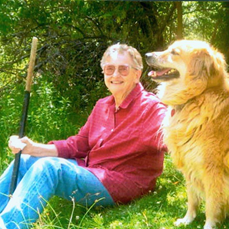 She was a charter member of Bearlodge Writers in Sundance and of the statewide writers group, Wyoming Writers, Inc., as well as a sustaining member of Women Writing the West and Western Writers of America.